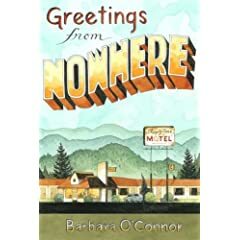 When you are trying to find books fit for a fifth grade student and you keep coming up empty handed, you are T-TOTALLY THRILLED when you come across a book such as Greetings From Nowhere by Barbara O'Connor. I am going to start with the most obvious selling point of this book for me. I absolutely adore the arrangement of chapters with a different character's points of views. Each chapter follows the view of the story through a different character. It is brilliant! I know, it has been done before, but I absolutely love the way it is SPECIFICALLY done in this book. It is seamless. The stories overlap just enough, but nothing is repeated in a way that says, "In case you forgot from last chapter." Each of the characters adds such a different dynamic to the novel. They all have their own inner struggles, but each has something to endear them to the reader. I hate to pick favorites but Loretta is my favorite character in the book. Of course as I read, I began to love every character for one reason or another. I was rooting for everyone in the end. The plot of the story follows the fate of a small motel, The Sleepy Time Motel in the Great Smoky Mountains. The hotel is owned by at widow named Aggie. She and her husband originally opened the successful motel years ago and now that he is gone and business is slow, Aggie is finding herself in a position of thinking about selling the motel. As each of the other characters is introduced, the fate of the motel improves. It is no secret that I wasn't really into the cover of O'Connor's Fame and Glory in Freedom, Georgia, but I think the cover on this book is delightful! I love the way it looks like a real postcard and is almost cartoon-ish. This one is hit for me. I guess I didn't address how this is a perfect book for fifth grade? Well, take my word, IT IS! The characters all have stories my students can relate to, the vocabulary is just right, and the story move quickly. I am very excited to recommend the book to my kiddos. I can't wait to see what they think of the chapter arrangements. But what I most want to ask them is, "Who is your favorite character?" 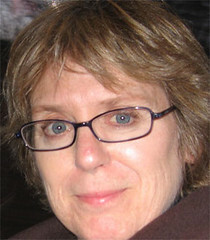 OMG, how could I have forgotten to mention--- on page 188 there is a list of guests and one of the guests is Hattie Norris from DAYTON, OHIO! Love-It! Okay, I just can't help myself. I was going to stay in the corner and be quiet and just read this review to myself 498 times a day - but I can't resist popping in here to say THANK YOU! I value your opinion so much - who better to review my books than a FIFTH GRADE TEACHER - particularly one who rocks like you! Love your review! I will be reading the book this week, and posting my review next weekend. I'm sure I'll love it as much as you did. I've noticed over time, we tend to have "like" opinions about books. My favorite character is Aggie. I've been waiting to hear what the Number One Barbara O'Connor fan would write in her review! Is this your next read aloud? It's mine. Starting tomorrow. You all make me so happy to do this blog. I was seriously ready to quit because my life is kind of crazy right now. Seeing your kind comments keeps me going! This is my next read aloud too. Starting at the end of the week. it isn't very often that I choose a read aloud that is this new but this one is PERFECT! I think Kirby was my favorite...I can't decide. This sounds like my next absolutely have to own it, even though I really, truly am going to stop spending so much money on books. I thought HOW TO STEAL A DOG was pretty darn close to the perfect read aloud!